This issue marks what could arguably be called the most anticipated team-up of Oliver’s “Hard-Travelling Hero” arc: Green Arrow and Green Lantern, who famously travelled the country together under the stewardship of Neal Adams and Dennis O’Neil. Benjamin Percy has made each of these team-ups unique and explored different parts of Ollie’s character. I really like the fact that Percy has Ollie and Hal Jordan skip over any past misgivings and start fresh. Percy gives Hal a certain level of intelligence that is often left by the wayside in favor of his “handsome flyboy” demeanor. While other writers typify Hal as a dumb jock, Percy shows that you can’t send man out into space for x amount of years without learning a thing or two. 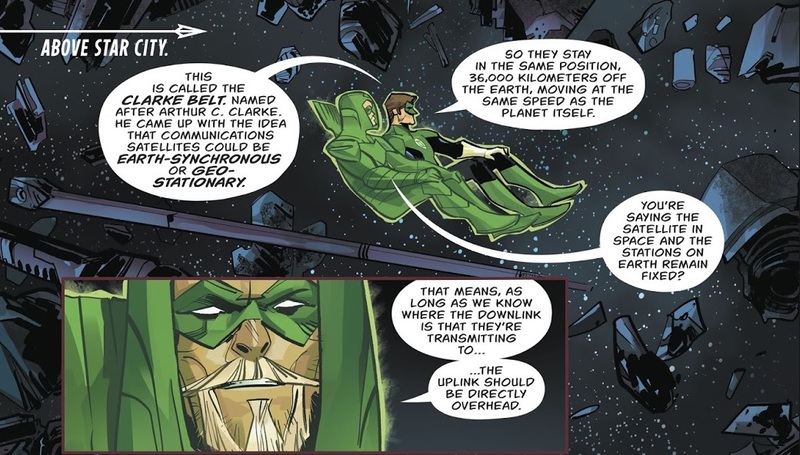 He also imagines several memorable uses for that GL ring of his: a hooded spacesuit for Ollie, a vintage space truck and an electromagnetic satellite tracer. Otto Schmidt’s imagination is getting a workout as well. In addition to Hal’s various ring constructs, he has the opportunity to draw a brief desert battle between motorcycled Green Arrow and a band of Ninth Circle road warriors. 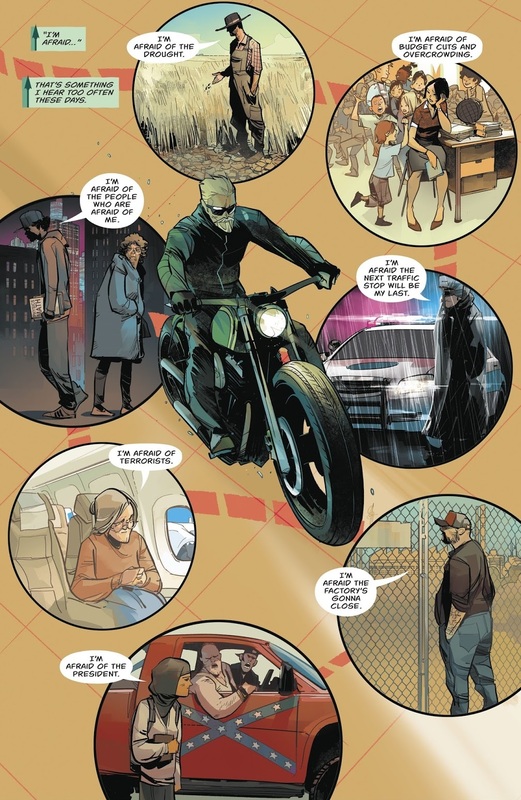 How great is it that we get a Mad Maxian Green Arrow sequence that isn’t even the main crux of the story? 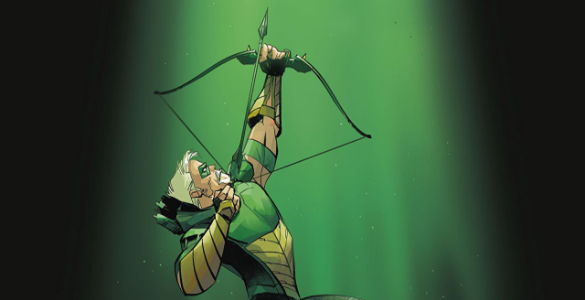 As ever, the most effective part of Green Arrow 30 comes in its real world parallels and allusions. Blinded by politics, some might argue that this is “liberal propaganda.” But really Percy is bypassing the argument altogether and tackling the real enemy that is fear — an excellent obstacle for a Green Lantern.